Singaporean artist Anthony Chua Say Hua is a talented multi-award winner of several local art competitions. Anthony works primarily in Chinese ink to create contemporary interpretations of modern subjects such as urban landscapes, old buildings as well as abstract compositions in his earlier "Nudes in Landscape" series. His paintings' strength lies in the bold use of brush strokes with various effects created by different types of brushes including the use of the less conventional feather brushes and direct application from squeezable plastic bottles. 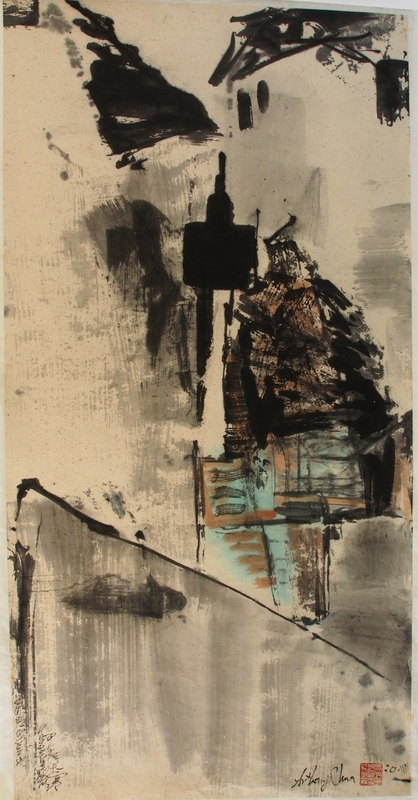 Anthony's creative processes are informed by both traditional Chinese ink and modern Western art strategies such as ink transfer and mark-making. The objective is to enable new artistic surfaces to be created and expressiveness articulated. The current old buildings(shop houses) series utilised generous ink washes loaded with colour paint. It enabled an all over effect that convey a sense of the city's pace-lively, serendipitous and vibrant.